One is given the distinct impression that the Norwegian National Center for Fetal Medicine (NCFM) and the Norwegian National Treatment Service for Advanced Invasive Fetal Medicine (Nasjonal behandlingstjeneste for avansert invasiv fostermedisin) are two separate 'national treatment services' located at St. Olavs Hospital HF (Trondheim University Hospital). Apparently, this engineered confusion has been officially recognized and documented by Directorate of Health in their Evaluering av nasjonal- og flerregional behandlingstjenester 2014 (Evaluation of national and multi-regional treatment services 2014). Given that Directorate of Health stated: "the National Center for Fetal Medicine was formally shut down July 7, 2011," why does the National Center for Fetal Medicine maintain a separate NSFM website that displays a 2018 copyright mark (© 2018 NSFM)? Also, the National Center for Fetal Medicine website currently identifies a total of 38 NSFM employees (ansatte), by name, in the following categories. Obvious Questions: Since NCFM/NSFM "was formally shut down July 7, 2011," is NCFM/NSFM operating as a rogue or private, virtual medical group outside the authority of Directorate of Health and Ministry of Health and Care Services? If NCFM/NSFM was "formally shut down July 7, 2011," as stated in Directorate of Health's "Evaluering av nasjonal- og flerregional behandlingstjenester 2014", for whom do the 38 employees identified on the NSFM website work, and from whose budget(s) are they paid? Is it possible Sturla H. Eik-Nes et al. are appropriating the formally retired NCFM/NSFM brand name to provide brand affiliation or halo benefits to promote their privately copyrighted (© 2007 Eik-Nes, Grøttum og Gjessing) 'eSnurra' product/service? Or, is the NCFM/NSFM name being used as some sort of cover? Again, Directorate of Health states: "When the service itself uses different designations in its annual report, it will confuse the reader." However, this same confusion is understandably amplified "when the service itself uses different designations" within various doctoral theses, academic journals and media channels for the marketing and promotion of the eSnurra "method" using the formally retired NCFM/NSFM brand name. In the absence of an explanation, it would appear this is another case of the tail wagging the dog. 1) "The chart is only for estimating the date of delivery. " 2) "Just as Boerhaave was not actually measuring the length of pregnancy, and the word "gestation" is used to describe the measurement of time from the last menstrual period to reflect this, so also there is no pretence that this method is determining fetal age." Dr. Hutchon made it explicitly clear that the prediction/estimation of fetal age is not the same as the prediction/estimation of EDD using the Hutchon Method of PDEE. "It is based on a Norwegian population material consisting of about 40000 pregnancies. Unlike older models (e.g., Naegel's rule ), eSnurra does not count back to the last menses while then adding a number of days, but calculates remaining time directly based on the fetus's thigh and head diameter measurements." "eSnurra is based on the older Snurra model, which has been standard in Norway since 1984." "In October 2014, the Directorate of Health appointed eSnurra as the only approved national term determination method." "eSnurra is available as a traditional calculator wheel, as a web-based calculator, as an App for iOS and Android and integrated into the ultrasound device and record systems." ​[The gestational age (GA) calculated by NCFM eSnurra Group's eSnurra "method" from the estimated end of pregnancy (i.e., the wrong end) using the equivalent of Naegele's rule, but in reverse, provides different results depending on which NCFM eSnurra Group platform is used (i.e., NCFM eSnurra pregnancy calculator wheel, website, iOS app or Android app). "The Directorate of Health recommends using one method, eSnurra, for the calculation of pregnancy length and term (letter of December 2014, PDF) . eSnurra is the best research-based method, and the most precise tool for evaluation of the term and duration of pregnancy. When using eSnurra, overtime (294 days) will occur 11 days over the estimated term date. The use of one method nationally ensures abortion-seeking women similarity to the law (avoiding geographical variations), will give a similar assessment of prematurity and unambiguous assessment of premature pregnancies. eSnurra as a national tool is readily available as a plastic wheel, mobile and tablet app and an open available web version (esnurra.no) . Wikipedia identifies Morten Dreier (see: https://no.wikipedia.org/wiki/Bruker:Mortendreier) as the primary editor of the Wikipedia entry for "eSnurra" (see: https://no.wikipedia.org/w/index.php?title=ESnurra&action=history)." Interestingly, Morten Dreier, prosjektleder IKT, is listed as an employee of NCFM. Moreover, Morten Dreier is an NCFM eSnurra Group coauthor and the developer of the NCFM eSnurra Group's mobile APPs. There is no information about "eSnurra" on either the NTNU or St Olavs Hospital website. NTNU Website: When one searches for "eSnurra" on the NTNU website, only 2 webpages are returned, the NTNU employee (Ansatte) webpage for Sturla H. Eik-Nes and the NTNU employee (Ansatte) webpage for Harm-Gerd Blass (See: https://www.ntnu.no/sok?query=eSnurra). Apparently, the National Center for Fetal Medicine, NCFM (Nasjonalt senter for fostermedisin, NSFM) announced a name change in 2015 to "Norwegian National Unit for Advanced Intervention and Invasis Therapy in Fetal Medicine​" ("Nasjonal behandlingstjeneste for avansert invasiv fostermedisin.") Interestingly, the name change had been ordered by Directorate of Health and Ministry of Health and Care in 2011, with NCFM apparently loathe to implement it. While the reason for the name change after 25 years was not provided with the announcement, the innocuous phrase "for formal reasons" raises more questions than it answers. Following is the name-change notification. However, Directorate of Health stated, "The National Center for Fetal Medicine was formally shut down July 7, 2011." "The department was the National Center for Fetal Medicine from 1989 to 2015, but had to change its name for formal reasons. The functions, treatments and skills are the same as before the name change." On the NSFM webpage: http://www.nsfm.no/web/nb/forskning/esnurra/ (item 11 from the list above) "eSnurra" is defined as follows. "eSnurra is the new, population-based methodology for term prediction and growth monitoring which was developed by NSFM. The method is the official method for term prediction and growth monitoring in Norway. Read more at http://www.esnurra.no/"
"International work has been an important part of NSFM's work since the early 1990s. We have participated in outreach programs, both in collaboration with ISOUG [sic] and WHO, and have taught and trained midwives and doctors both in field and from our base in Trondheim. ​eSnurra Website (Norwegian) (http://www.nsfm.no/esnurra/). Interestingly, the URL: http://www.nsfm.no/​ redirects to St Olavs website, however, the following URLs: http://www.nsfm.no/esnurra/, http://www.nsfm.no/web/nb/forside/ and others do not redirect to the St Olavs website. eSnurra is the new Norwegian method for term estimation and growth control. Instead of collecting data from a smaller group of pregnant women selected, supposedly, with reliable LMP date and use these data as the basis for the calculation of term and fetal weight, we have built in information from about 40,000 pregnancies into eSnurra. Thus, in the preparation of eSnurra, we have avoided basing ourselves on uncertain information about when the pregnancy started; term is instead calculated from the remaining pregnancy length from ultrasound examination to birth. This process is thoroughly described in the article (ref Gjessing et al. 2007)." On the eSnurra Facebook page "eSnurra" is identified as a "Medical Company in Trondheim, Norway" (https://www.facebook.com/pg/esnurra/). 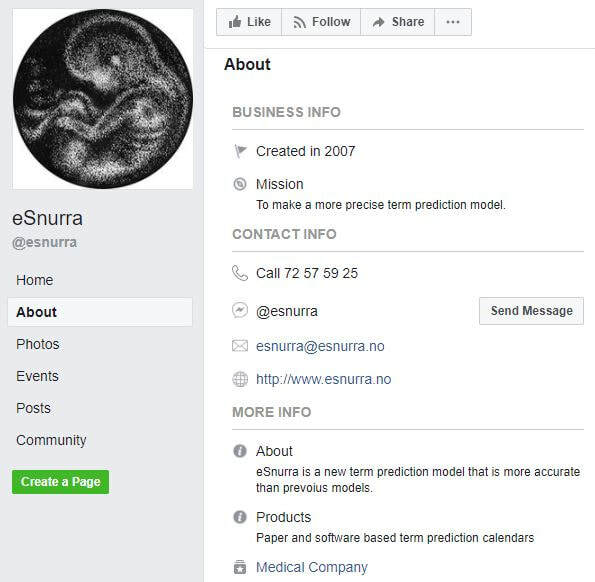 Interestingly, the eSnurra Facebook page neither mentions nor identifies any association between eSnurra and the Norwegian National Center for Fetal Medicine (NSFM/NCFM) or St Olavs Hospital (Trondheim University Hospital). Specifically, the National Center for Fetal Medicine's eSnurra website (http://www.nsfm.no/esnurra/) is not identified on the eSnurra Facebook page. In short, "eSnurra" is presented and promoted on its Facebook page as a private, "Medical Company in Trondheim, Norway." which is consistent with the claimed copyright ownership of "eSnurra" by the 3 original members of NCFM eSnurra Group (© eSnurra, Eik-Nes, Gjessing og Grøttum) who were also the 3 supervisors of Inger Økland's 2012 NTNU dr.philos. Thesis. The only "Contact" website identified on the eSnurra Facebook page is that of the eSnurra "Medical Company": http://www.esnurra.no/, and the only contact email address identified is that of the eSnurra "Medical Company": esnurra@esnurra.no. The National Center for Fetal Medicine's eSnurra website (http://www.nsfm.no/esnurra/) is not identified on the eSnurra Facebook page. However, and quite strangely, the telephone number (72 57 59 25) identified as the contact telephone number in the "Contact" section of the eSnurra Facebook page is the phone number to the "National Treatment Service for Advanced Invasive Fetal Medicine" ("Nasjonal behandlingstjeneste for avansert invasiv fostermedisin") at St Olavs Hospital (Trondheim University Hospital): https://stolav.no/avdelinger/kvinneklinikken/fodeavdelingen/senter-for-fostermedisin-nsfm. Consequently, it would appear eSnurra, a private "Medical Company in Trondheim, Norway," uses the telephone number and telephone services of the National Treatment Service for Advanced Invasive Fetal Medicine for business purposes. Moreover, this telephone number (72 57 59 25) is answered by an employee of St Olavs Hospital (Trondheim University Hospital), not an employee of the eSnurra "Medical Company in Trondheim, Norway." ​All of this is incredibly confusing and raises some interesting questions regarding the legal entity and functional entity definitions of: eSnurra, National Center for Fetal Medicine (NCFM/NSFM) and Norwegian National Unit for Advanced Intervention and Invasive Therapy in Fetal Medicine relative to each other and relative to St. Olavs Hospital HF (Trondheim University Hospital), NTNU and Helse Midt-Norge RHF. For example, what are the respective competence and treatment domains of National Center for Fetal Medicine (NCFM/NSFM) and "Norwegian National Unit for Advanced Intervention and Invasive Therapy in Fetal Medicine​" ("Nasjonal behandlingstjeneste for avansert invasiv fostermedisin.")? Additionally, Inger Økland's 2012 NTNU dr.philos. Thesis, an ethically and academically compromised document, is promoted on the eSnurra Facebook page. Økland's thesis is the one and only publicly available document used by Directorate of Health to justify their knowledge-obviated, medically & ethically flawed 2014 Recommendation with their exclusive selection and implementation of NCFM eSnurra Group's "method" (i.e., the appropriated, plagiarized, misused Hutchon Method of PDEE) within a government-mandated protocol of evidence-obviated medicine in the form of unilateral ultrasound-based pregnancy dating. DISPUTATION takes place Friday, 13.01.2012 at: 10.15 in Auditorium ØHA11, Øya Helsehus. Professor Zarko Alfirevic is appointed as the first opponent and Senior Adviser Jens Grøgaard is appointed as the second opponent. The candidate's supervisors have been Professor Sturla Eik-Nes, NTNU, Professor Håkon K. Gjessing, National Institute of Public Health and Professor Per Grøttum, UiO. The NCFM eSnurra Group's Eik-Nes et al. 2005 and Gjessing et al. 2007, appropriated and plagiarized Dr. Hutchon's original idea and method of Population-based Direct EDD Estimation, from Dr. Hutchon's seminal Hutchon 1998, his other publications, his website, Hutchon.net and, likely, from his manuscript(s). NCFM eSnurra Group claimed Dr. Hutchon's original idea and method of PDEE as NCFM eSnurra Group's own original idea and method, thereby engaging in what is now 13 years of ongoing research misconduct via plagiarism. Gjessing et al. 2007 cited and referenced Taipale & Hiilesmaa 2001 via citation 22 as follows. Reference 22: "22. Taipale P, Hiilesmaa V. Predicting delivery date by ultrasound and last menstrual period in early gestation. Obstet Gynecol 2001; 97: 189–194." However, there is noting, whatsoever, in Taipale & Hiilesmaa 2001 that substantiates the claim of citation 22 in Gjessing et al. 2007. Citation 22 is a classic citation distortion. Specifically, citation 22 is a dead end citation which is used as a mechanism to invent a fact, albeit an alternative fact. Moreover, citation 22 in Gjessing et al. 2007 served to conceal the important fact that Pekka Taipale, the lead author of Taipale & Hiilesmaa 2001 was employed by Norway's NCFM Group at Trondheim University Hospital where he worked as a post-doc researcher (September 1998 – June 2000) under the supervision of Sturla H. Eik-Nes. Additionally, citation 22 served to conceal the participation of Sturla H. Eik-Nes and Per Grøttum on Taipale & Hiilesmaa 2001, because Sturla H. Eik-Nes and Per Grøttum, uncharacteristically, forewent authorship credit and all other acknowledgement. Moreover, citation 22 served to conceal the true origin of the idea and method of Population-based Direct EDD Estimation from the academic institutions involved, funding entities, editors, referees, publishers and readers of Taipale & Hiilesmaa 2001 and Gjessing et al. 2007. Importantly, when Norway's NCFM Group's Gjessing et al. 2007 cited and referenced Norway's NCFM Group's Taipale & Hiilesmaa 2001, Norway's NCFM Group had cited and referenced themselves. This combined strategy of: 1) self-referencing, 2) fact invention and 3) dead end citation created a provenance barrier to my idea and method of PDEE (Hutchon 1998) within the literature. Taipale & Hiilesmaa 2001 was used as a red herring to distract and mislead from the true provenance chain for the idea and method of PDEE. Norway's NCFM group, headed by Sturla H. Eik-Nes, exploited and continue to exploit Taipale & Hiilesmaa 2001 as a red herring to the true provenance of Dr. Hutchon's idea and method of PDEE in order to claim his original idea and method as their own original idea and method. While citation 22 (or, maybe, Catch-22) in Gjessing et al. 2007 helped to embolden Norway's NCFM Group, headed by Sturla H. Eik-Nes, to engage in long-term, ongoing research misconduct via plagiarism (2001 – Present), it was UOG & ISUOG's complete inaction regarding my letters and other communications of misconduct in Gjessing et al. 2007 that enabled the long-term, ongoing research misconduct via plagiarism by Norway's NCFM Group, headed by Sturla H. Eik-Nes, President ISUOG (1998 – 2002). To further make the point about citation distortions, consider the excerpt below from Taipale & Hiilesmaa 2001 (p. 192). "It has been suggested that the prediction error between the estimated day of delivery and the actual day of delivery should be 7 to 8 days. 14 In our study, the prediction error at 11–16 weeks’ gestation was 7.3 days for the best ultrasound determinant, when premature deliveries were excluded." The actual text from citation  in the excerpt above is included in the excerpt below. The text of the cited reference explicitly states "the prediction error (SD)" , not the mean prediction error. All discussion of prediction error in Taipale & Hiilesmaa 2001 is based on mean prediction error, not standard deviation (SD). Specifically, Figure 1 (p. 191) plots gestational age on the X-axis and average (or mean) prediction error on the Y-axis . Table 2 (p. 191) includes average (or mean) prediction error, but does not include standard deviation. Nevertheless, a direct comparison is made between the mean prediction error in Taipale & Hiilesmaa 2001 with the prediction error standard deviation (SD) in Persson 1999. Clearly, the 'mean' and the 'standard deviation' have different meanings. This type of citation distortion is termed citation diversion. Included below is an excerpt of the one and only mention of standard deviation (SD) in all of Taipale & Hiilesmaa 2001, a methods or metrics comparison study for estimating day of delivery. "...estimate which ultrasound measurement, crown-rump length, BPD, or FL, is best for predicting the day of delivery..."
Which begs the question: Is best for whom? Ergo, Tunón et al. 1996 define "significantly better" as a 6% margin which in a political election could be considered "significantly better," but in the above, maybe not so much depending on one's personal interpretation of the adverb "significantly" in the context of excluding all reliable LMP data from medical evidence. Or, for example, how is one to interpret the magnitude of "slightly better precision" (p. 193) in Taipale & Hiilesmaa 2001 when NCFM Snurra Group state "significantly better" means a 6% margin? One should not have to ascribe one's or others' personal interpretations of precision when SD is readily available (or should be readily available) as objective quantification of precision (i,e., the random error). A simple graphic enables a quick mental model of the information excluded or left to individual interpretations when SD (precision) is intentionally excluded and replaced with adverbs such as "significantly" and "slightly" and adjectives such as "more" and "less." Figure 1 of Taipale & Hiilesmaa 2001 shows a plot of average prediction error for CRL, BPD, FL and certain LMP on the y-axis, with 6 bins for 6 gestational weeks on the x-axis, with 3 weeks (8w+0 through 10w+6) excluded, without a reason. Nevertheless, if this same plot had been created for the SDs of the prediction errors for CRL, BPD, FL and certain LMP, the information illustrated in the example graphic above would have been available, but a similar SD vs. GA plot was excluded. Figure 2 of Taipale & Hiilesmaa 2001 does not explain the decision criteria for selecting CRL or BPD for inclusion in the stacked column charts. "Figure 2. Comparison between ultrasound (according to crown-rump length or biparietal diameter) and certain last menstrual period 1 280 or 1 282 days in estimating the day of delivery." A key consideration in a prediction/estimation method, such as NCFM Snurra or the Hutchon Method of PDEE, is not whether the method or the metric(s) deliver a correct GA or EDD prediction/estimation on average, but what the likely error is for GA or EDD assigned to individual pregnancies that is important, especially to pregnant women. What good is a method or fetal metric predictor if it is correct on average but delivers inaccurate or grossly inaccurate GA or EDD predictions/estimations 60% of the time. It is the consideration and discussion of the likely error for individual predictions which is completely missing in Tunón et al. 2000 and Taipale & Hiilesmaa 2001 because standard deviations (SD) of prediction errors (random errors) were not discussed, intentionally. Again, consideration and discussion of the likely errors for individual GA or EDD predictions/estimations assigned to individual pregnancies were excluded, intentionally, in NCFM Snurra Group's Tunón et al. 2000 and Taipale & Hiilesmaa 2001. CRL = crown-rump length; DtD = days to delivery; BPD = biparietal diameter; FL = femur length; LMP = last menstrual period. Deliveries before 37 weeks were excluded. The data include measurements from 8–16 completed weeks. NCFM eSnurra Group's Taipale & Hiilesmaa 2001 was published 4-years and 6-years prior to NCFM eSnurra Group's Eik-Nes et al. 2005 and Gjessing et al. 2007, respectively, while Sturla H. Eik-Nes, founder and leader of NCFM eSnurra Group, was President of ISUOG. Gjessing et al. 2007 states: "Population prediction of remaining time has been used previously only to assess prediction quality 22." This serves to confirm the term "prediction quality," as defined by NCFM eSnurra Group, was restricted to average prediction error or systematic error (mean, bias) because there was neither identification nor discussion of random error (standard deviation, precision) in NCFM Snurra Group's Taipale & Hiilesmaa 2001. This NCFM eSnurra Group definition of "prediction quality" intentionally excludes the quantification of random error (standard deviation, precision). NCFM eSnurra Group's Gjessing et al. 2007 states: "Our approach extends to constructing a full set of prediction models." However, it is a fact the NCFM eSnurra Group's Taipale & Hiilesmaa 2001 resulted in "a full set of prediction models" consisting of CRL, BPD & FL. It is interesting, and telling, to note NCFM Snurra Group did not disclose their supervision of, and contributions to, Taipale & Hiilesmaa 2001, nor did NCFM Snurra Group disclose the fact Pekka Taipale was an NCFM employee within the NCFM Snurra Group. It is a 20-years old, well-documented fact the original idea and method of Population-based Direct EDD Estimation (PDEE) had been formulated by Dr. David J. R. Hutchon beginning in 1995 at Department of Obstetrics and Gynaecology, Memorial Hospital, Hollyhurst Road, Darlington, Co. Durham DL3 6HX, U.K. and published July 19, 1998 (Hutchon 1998), along with a demonstration of his original idea and method of PDEE, using a dataset of both CRL and BPD in his seminal Hutchon 1998 and website, 7 years and 9 years before NCFM eSnurra Group appropriated and plagiarized Dr. Hutchon's original idea and method of PDEE, and claimed it as their own original idea and method in NCFM eSnurra Group's Eik-Nes et al. 2005 and Gjessing et al. 2007, respectively, both of which were published by Ultrasound in Obstetrics & Gynecology (UOG), also known as The White Journal, the official journal of the International Society of Ultrasound in Obstetrics and Gynecology (ISUOG). This was followed by at least 15 additional NCFM eSnurra Group publications, all of which appropriated and plagiarized Dr. Hutchon's original idea and method, the Hutchon Method of PDEE, most recently in NCFM eSnurra Group's Gjessing et al. 2017, published April 2017 by UOG and Gjessing et al 2017b, published October 2017 in Norsk Epidemiologi. Moreover, Dr. Hutchon's first manuscript of his idea and method of PDEE was published 19.07.1998 in OBGYN.net (Hutchon 1998). Dr. Hutchon's second, more robust manuscript was received 13.07.1999 by UOG, which UOG and coded as "UOG 99/155 Proposed methodology for the preparation of ultrasound charts for estimating the date of delivery." Sturla H. Eik-Nes, NCFM eSnurra Group's founder, leader and 1 of the 3 "claimed copyright owners" of NCFM eSnurra, was President of ISUOG (1998 – 2002). Consequently, one cannot ignore the obvious question: Were Pekka Taipale and Vilho Hiilesmaa set up and used as patsies (unwitting blame takers & fall guys) as a beard (screen) for NCFM eSnurra Group's ambition-driven agenda to appropriate and plagiarize Dr. Hutchon's original idea and method of PDEE, and claim it as their own original idea and method? Prior to Taipale & Hiilesmaa 2001 there is no evidence Pekka Taipale and Vilho Hiilesmaa had researched or published in the field of ultrasound fetal biometry (i.e., other than their work directly related to nuchal translucency in first-trimester scans) and there is no evidence they have published in the field of ultrasound fetal biometry since Taipale & Hiilesmaa 2001, which was supervised by Sturla H. Eik-Nes of NCFM Snurra Group. Moreover, the Taipale & Hiilesmaa 2001 collaboration never cited nor referenced nor credited nor acknowledged any source for the PDEE method used in Taipale & Hiilesmaa 2001. Whatever the intent or strategy of NCFM Snurra Group, it was and remains a well-documented fact Dr. Hutchon's original idea and method of PDEE had been published 19.07.1998 in Dr. Hutchon's seminal Hutchon 1998 in OBGYN.net, 2.5 years, 7 years and 9 years before NCFM Snurra/eSnurra Group's Taipale & Hiilesmaa 2001, Eik-Nes et al. 2005 and Gjessing et al. 2007, respectively, were published. Interestingly, the bottom line conclusion of Taipale & Hiilesmaa 2001 was completely consistent with NCFM Snurra Group's agenda of excluding a pregnant woman's key pregnancy dates from medical evidence to ensure unilateral reliance on ultrasound for GA & EDD assignments in the second-trimester, i.e., the routine 18-week ultrasound exam which is widely reported to be less accurate than first-trimester ultrasound and, is completely consistent with NCFM eSnurra Group's current "method' (i.e., an appropriated, plagiarized & misused implementation of Dr. Hutchon's idea and method of PDEE) within a government-mandated protocol of evidence-obviated medicine which obviates all key pregnancy dates, without a pregnant woman's prior, informed, voluntary, explicit consent. "The smaller prediction error in our study suggests that dating pregnancies by ultrasound is more accurate at 8–16 weeks than at 12–22 weeks. The prediction error in our series was lowest at 12–14 weeks' gestation." "Assessment of gestational age from the time of IVF, CRL and BPD in pregnancies conceived after in vitro fertilization shows equally high agreement between the three methods, this supports the use of ultrasound as a reliable method for estimation of gestational age." "Although our main indication for screening at 13–14 weeks was to identify fetuses with increased nuchal translucency, 7 the opportunity to obtain fetal ultrasonic dimensions emerged as a useful adjunct. However, it might not be worth switching from midtrimester screening to 13-week screening for slightly better precision in dating." Notice the last 5 words, "slightly better precision in dating" even though "precision" had never once been objectively quantified with SD, at least not in Taipale & Hiilesmaa 2001, and the phrase "slightly better" without objective quantification is nothing more than a personal opinion similar to the phrase "significantly better." This was the process of bending science to conform with NCFM Snurra Group's non-science agenda. Much more on this later. "Conclusion: Ultrasound was more accurate than LMP in dating, and when it was used the number of postterm pregnancies decreased. Crown-rump length of 15–60 mm was superior to BPD, but then BPD (at least 21 mm) was more precise. Combining more than one ultrasonic measurements did not improve dating accuracy." ​Understanding this conclusion required work. While the statement below speaks for itself with respect to evidence-obviated medicine it is literally the last sentence, the bottom line of the NCFM Snurra Group's recognized, documented collaboration on Taipale & Hiilesmaa 2001, which deserves a modicum of consideration. "We do not see any reason to use LMP for dating when adequate ultrasonic data are available by midpregnancy." ​With respect to: "We do not see any reason to use LMP for dating..." Let us play along. Why would anyone even think about using all available medical evidence, including a pregnant woman's combined, fully corroborating, factual LMPD/OTPD/SCID-based GA & EDD to cross-check ultrasound-based GA & EDD values for reasonableness, errors or efficacy when ultrasound-based GA & EDD values are assigned by a government-selected, exclusive provider; a provider selected behind closed-doors against the explicit warnings of the consequences from the nation's medical experts; a government-selected, exclusive provider with an appropriated, plagiarized, misused method; a government-selected, exclusive provider commissioned to use a government-mandated protocol of evidence-obviated medicine, the purpose of which is to obviate all of a pregnant woman's factual, key pregnancy dates at the scheduling of the routine 18wUSE, without her prior, informed, voluntary, explicit consent; obviated to ensure no medical evidence exists to crosscheck the ultrasound-based GA & EDD values of NCFM eSnurra Group's "method" (i.e., the appropriated, plagiarized, misused Hutchon Method of PDEE) which is almost exclusively reliant on the problematic, unreliable BPD measurement for estimation of EDD and, therefrom, calculation of GA using the equivalent of Naegele's rule, in reverse, for which a pregnant woman must assume an undisclosed, quantified, published 12.8% risk for herself and her fetus/baby, that her assigned NCFM eSNurra BPD-based EDD will be grossly inaccurate (< -14 days or > 14 days), while potentially masking fetal pathology, for use in all medical thinking, medical decision-making and medical actions. Given that a government-mandated protocol of evidence-obviated medicine mandates medical evidence (i.e., a woman's key pregnancy dates) is obviated from any and all medical thinking, medical decision-making and medical actions with respect to obstetric medicine, fetal medicine and obstetric clinical care, what could possibly go wrong? Welcome to Laila's case, and other women's cases. The first sentence of the first page of both the English and Norwegian versions of NCFM eSnurra Group's websites state: "eSnurra is a new method for calculating Estimated Date of Delivery (EDD)"
First, NCFM eSnurra Group's "method" (i.e., the appropriated, plagiarized, misused Hutchon Method of Population-based Direct EDD Estimation) was not new, as it had been published in Dr. Hutchon's seminal Hutchon 1998, 9 years before NCFM eSnurra Group's Gjessing et al. 2007. Moreover, NCFM eSnurra Group deceptively conflate EDD estimation with GA estimation. It is a fact NCFM eSnurra Group's "method" predicts/estimates EDD and, therefrom, GA must be calculated (not predicted/estimated) using the equivalent of Naegele's rule, in reverse. Consequently, if NCFM eSnurra BPD-based EDD is grossly inaccurate, the calculated GA also must be grossly inaccurate. In NCFM eSnurra Group's Eik-Nes et al. 2006 authors claimed: "...to predict gestational age and expected day of delivery" ; and, the same was done in NCFM eSnurra Group's Gjessing et al. 2007 which claimed: "... the aim of this study was to develop a method for estimating expected day of delivery and gestational age..." This intentional obfuscation promotes the idea that GA and EDD prediction/estimation are the same and that calculation is synonymous with prediction/estimation. They are not the same. NCFM eSnurra Group's intentional obfuscation is an example of the art of bending science; however, in this case, NCFM eSnurra Group engage in the art of ﻿bending policy-relevant science﻿. Directorate of Health believe GA and EDD prediction/estimation are the same and that calculation is synonymous with prediction/estimation. Interestingly and strangely, in the very first sentence of both their English and Norwegian websites for 'eSnurra', NCFM eSnurra Group state "eSnurra is a new method for calculating (beregning) EDD, GA and fetal growth." What happened to predicting/estimating EDD or GA? The NCFM eSnurra Group made several patently false statements (emphasis added) in: 1) their Økland et al. 2007, an 08.10.2007 Poster Abstract at the 17th World Congress on Ultrasound in Obstetrics and Gynecology and 2) in NCFM eSnurra Group'S Gjessing et al. 2007. Clearly, in Directorate of Health's 13.10.2014 letter to Ministry of Health and Care Services, Directorate of Health believed NCFM eSnurra Group originated the idea and developed the method of Population-based Direct Estimation of EDD (PDEE) in collaboration with University of Oslo (UiO) and Norwegian Institute of Public Health (NIPH) when, in reality, NCFM eSnurra Group had appropriated, plagiarized and misused the Hutchon Method of PDEE which is the original idea of Dr. David J. R. Hutchon who developed his idea into the Hutchon Method of PDEE beginning in 1995 at Memorial Hospital, Darlington, U. K., Hutchon 1998. "eSnurra is developed at the National Center for Fetal Medicine (NSFM) in Trondheim in Collaboration with the Department of Medical Informatics at UiO and National Public Health Institute in Oslo. It is a further development of Snurra that was introduced in 1984 and which until 2005 was in national use. Validation with approximately 16,000 pregnant women had shown that there was a systematic error (bias) in the lower area of the measurements made with Snurra. The development of eSnurra was intended to make a better method for predicting fetal age and term for use throughout the Norwegian the population of pregnant women. eSnurra is developed on the basis of approx. 120 000 ultrasound measurements of 41 343 pregnant women at NSFM and thus the method is population-based. "eSnurra er utviklet ved Nasjonalt senter for fostermedisin (NSFM) i Trondheim i samarbeid med Seksjon for medisinsk informatikk ved UiO og Nasjonalt Folkehelseinstitutt i Oslo. Det er en videreutvikling av Snurra som ble introdusert i 1984 og som fram til 2005 var i nasjonalt bruk. Validering med ca 16 000 gravide kvinner hadde vist at det forelå en systematisk feil (bias) i det nedre området av målingene gjort med Snurra. Utviklingen av eSnurra hadde som formål å lage en bedre metode for prediksjon av fosteralder og termin til bruk på hele den norske populasjonen av gravide. eSnurra er utviklet på bakgrunn av ca. 120 000 ultralydmålinger på 41 343 gravide ved NSFM og metoden er dermed populasjonsbasert." In her 2012 NTNU dr.philos. Thesis (p. 28 & 44), Inger Økland identified what is required for a population-based model to be validated for a specific population, such as Trondheim vs. Bergen. Also, it states the "the methods must be re-calibrated when the examination practice and the population distribution change," such as when "the methods" are used for a different population within a country (e.g., Trondheim vs. Bergen) or within a different country. To paraphrase Økland's statements (above) regarding the population-based method with the addition of a few specific, relevant details: If the NCFM eSnurra Group's population-based method (i.e. the appropriated, plagiarized, misused Hutchon Method of Population-based Direct EDD Estimation) were to be used, say, in the Philippines, it would be necessary to collect quality-assured historical database records of past pregnancies in the Philippines-population containing the following data elements: 1) ultrasound date, 2) the set of ultrasound-based fetal metric measurements and 3) actual date of delivery (all 3 data elements constitute what Økland terms "reference material") in order to build a set of population-based NCFM eSnurra models (i.e., 1 model for each of the 4 fetal metrics in the set of NCFM eSnurra's set of fetal metrics (i.e., CRL, BPD, FL & MAD plus 1 model for growth/weight), all specific to the Philippines-population; and, each model would need to be validated for the Philippines-population before it could be used within the Philippines-population to estimate EDD and, therefrom, calculate GA using the equivalent of Naegle's rule, in reverse, for pregnancies in the Philippines-population. However, when one visits the NCFM eSnurra Group's website, it is not possible to identify or to select a country-population-specific model for an individual pregnancy, nor is this possible via NCFM eSnurra Group's Android or iOS APPs. Moreover, NCFM eSnurra Group's website states: "most ultrasound machine models support the use of eSnurra for term..." Which begs the question: "Why do"most ultrasound machine models" not also "support the use of eSnurra for" gestational age? Also, this implies each ultrasound machine would need to be loaded with all 450 population-based NCFM eSnurra Group models into the machines software (certainly possible) to cover the 90 countries stated by Directorate of Health, or the ultrasound machine manufacturer or dealer would have to load a country-population-specific set of "validated" country-population-based NCFM eSnurra models into each ultrasound machine depending in which country-population each ultrasound machine was destined to be shipped and used. Consider if NCFM eSnurra Group's population-based "method" with models trained/built on the > 95% White Norway-Trondheim population, were to be used in the Philippines and South Africa, where the populations are < 10% White. Then, consider this in the context of the findings from the "Racial/Ethnic Standards for Fetal Growth, the NICHD Fetal Growth Studies" or Buck Louis et al. 2015, are included below. Also, consider the conclusion of Shipp et al. 2001 regarding race and fetal metrics relative to genetic screening. This is how NCFM eSnurra Group's medico-marketing agenda abuses the medical science and that which is publised, as there is no evidence to suggest NCFM eSnurra Group supported, or is supporting, 450 country-population-specific NCFM eSnurra models. NCFM eSnurra Group have simply made the Norway-Trondheim area population models available to any and all populations in any and all countries by making their NCFM eSnurra EDD, GA & Weight calculators available, globally, via their pregnancy wheel, their iOS and Android APPs for mobile devices and the NCFM eSnurra website; none of which identity the Norway-Trondheim area population as the population upon which all NCFM eSnurra EDD, GA & Weight calculators are based, entirely. Økland was both correct and quite clear in her 2012 NTNU dr.philos. Thesis (excerpts above) regarding population-based models being specific to a specific population; a point also made by Dr. Hutchon in his seminal Hutchon 1998, 14 years earlier, of which ​Økland had been well aware, yet intentionally did not cite, because she had also stated a claim of novelty: "the new population-based term prediction model, eSnurra" had been developed by NCFM eSnurra Group via their Gjessing et al. 2007 in her 2012 NTNU dr.philos. Thesis; a thesis supervised by 3 members of NCFM eSnurra Group who were/are the 3 claimed "copyright owners" of NCFM eSnurra Group's "method" (i.e., the appropriated, plagiarized, misused Hutchon Method of PDEE) and the 3 authors of of NCFM eSnurra Group's Gjessing et al. 2007. The study which was "the basis for the new population-based term prediction model, eSnurra" was not NCFM eSnurra Group's Gjessing et al. 2007, it was Dr. Hutchon's study, Hutchon 1998, 9 years earlier (i.e., 14 years earlier than Økland's 2012 NTNU dr.philos. Thesis) of which, again, ​Økland had been well aware, yet she refused to cite or acknowledge Dr. Hutchon for his original idea and method, the Hutchon Method of PDEE. Moreover, and as a published member of NCFM eSnurra Group, Økland remained completely silent regarding NCFM eSnurra Group's appropriation, plagiarism and misuse of Dr. Hutchon's original idea and method, the Hutchon Method of PDEE. And, on top of all this, Økland stated: "[NCFM eSnurra] was a new approach that seemed obvious to statisticians and mathematicians, but not equally obvious to obstetricians." Økland had known Dr. Hutchon was a practicing obstetrician when he formulated his original idea and method, the Hutchon Method of PDEE, having cited Dr. Huthon via Hutchon 1998 and Hutchon & Ahmed 2001 a total of 11 times in her 2012 NTNU dr.philos. Thesis, but only for minor points regarding LMP usage and selection bias in traditional GA estimation methods, not for his Hutchon Method of PDEE. This was nothing less than an engineered, belittling insult to Dr. Hutchon; an insult of which he only recently became aware. Included below is an epic and classic display of excessive claiming behavior of plagiarists, courtesy of NCFM eSnurra Group's Håkon K. Gjessing, Per Grøttum, Inger Økland, & Sturla H. Eik-Nes. It is very interesting to see the median-based direct prediction method that we developed for second trimester measurements [,] being applied to first trimester data. "However, we believe that such technical differences are of secondary importance to the overarching principle of direct median prediction." "Before addressing the specific comments, we are pleased to explain why we disagree with Gjessing et al. when they argue that they ‘fail to see any particular advantage of the alternative quantile smoothing approach’ we developed. These advantages are called comparability and reproducibility. 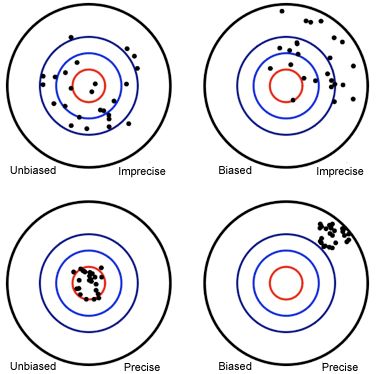 Given that no method could be considered perfect to answer a scientific question, the availability of different analytic strategies offers a way to compare the benefits and weaknesses of each approach, strengthening the plausibility of the findings if the results are consistent between different choices. This issue is closely related to the second advantage: our spline-based approach  is performed through functions currently implemented in the major statistical packages, for example Stata (StataCorp, LP, TX) with rc_spline or mkspline, R (R Development Core Team) with ns, and SAS (SAS Institute) with proc transreg. The availability of these functions gives the opportunity to replicate our method in other populations, and to compare it against potential alternative solutions. To our knowledge, the local linear quantile regression (LLQR)  proposed by Gjessing et al. is not directly implemented in any major statistical software, and they needed to develop their own routine which is not available to other researchers." Consequently, one would think this published "Comment & Reply Correspondence " would present something of an intriguingly rare event for analysis with respect to the ethos of international, academic medical journal editing, publishing and responsibility to the public trust. Items 1-3 above were logical, next-steps efforts from atop the shoulders of Dr. Hutchon. It is unfortunate Dr. Hutchon did not secure the funding and collaboration with a national medical center for the statistical expertise he needed to help him take the next steps he had envisioned and of which he had written; and, it is even more unfortunate after 12-years Dr. Hutchon remains unacknowledged and unattributed for his original idea and method, the Hutchon Method of Population-based Direct EDD Estimation; the method appropriated, plagiarized and misused by NCFM eSnurra Group, funded by the Norwegian government, courtesy of Norway's taxpayers. That said, item 4 served to obviate Dr. Huthcon's 2 key, factual, cautionary statements from those who would seek additional information, knowledge and perspective by following what would otherwise be proper attributions in the form of citations and references within NCFM eSnurra Group's publications. Strangely, Dr. Hutchon was cited in NCFM eSnurra Group's Økland et al. 2010, Økland et al. 2011 & Økland et al. 2012 for LMP use with Naegele's rule and possible selection bias in traditional systems based on the Campbell Method of GA Estimation (Campbell 1969). Incredulously, NCFM eSnurra Group did not cite Dr. Hutchon for his seminal Hutchon 1998, his original idea and method, the Hutchon Method of PDEE; instead, they cited Hutchon & Ahmed 2001, a 20-sentence letter to the editor of BJOG regarding Baskett & Nagele 2000: "Naegele's rule: a reappraisal" which presents the Hutchon Method of PDEE in sentences 9 through 20 and includes 2 citations to a reference of Dr. Hutchon's seminal Hutchon 1998 which included an active URL link. However, the 3 aforementioned NCFM eSnurra Group publications never seemed to get past sentence number 6, which is included below. "The traditional ultrasound dating chart does not provide an expected date of delivery but does provide a virtual last menstrual period from which the expected date of delivery can be calculated using Naegele's rule." NCFM eSnurra Group could have cited themselves for this given the fact their prior NCFM Snurra system had used the Campbell Method of GA Estimation with Naegele's rule for almost 25 years to estimate GA and, therefrom, calculate EDD using the equivalent of Naegele's rule. Citing Dr. Hutchon for Naegele's rule instead of his original idea and method of PDEE, had all the hallmarks of an engineered insult in the form of an intended belittling. Nevertheless, and without putting too fine a point on it, NCFM eSnurra Group has been dining out on Dr. Hutchon's original idea and method of PDEE, for the last 13 years, 17 years if one includes NCFM Snurra Group's Taipale & Hiilesmaa 2001 which also appropriated and plagiarized the Hutchon Method of PDEE. The NCFM eSnurra disclosure of statistical techniques in Gjessing et al. 2007 demonstrate comparability and reproducability by other researchers is not possible due to their use of custom statistical analysis software which is not available in the major statistical packages used by most researchers, thus creating what is commonly termed a black box model or system, a point well made by Salomon et al. in their "Comment & Reply Correspondence " with NCFM eSnurra Group. In the excerpt below, the phrase "which were verified in part against the quantreg implementation of QR models in R" serves to solidify this point. This may very well explain why after 10-years there is still no evidence NCFM eSnurra Group's models and statistical techniques having been reproduced and verified by independent researchers. "All statistical analyses, including the LLQR, were performed using our own implementations in R version 2.2.1 for Windows 19, which were verified in part against the quantreg implementation of QR models in R 20." (Source: "A direct method for ultrasound prediction of day of delivery: a new, population-based approach," H. K. GJESSING, P. GRØTTUM and S. H. EIKNES; Ultrasound Obstet Gynecol 2007; 30: 19–27, p. 21. DOI: 10.1002/uog.4053) References: 19 R Development Core Team. R: A language and environment for statistical computing. R Foundation for Statistical Computing: Vienna, 2005; http://www.r-project.org [Accessed 14 December 2006]. 20 Koenker R. quantreg: Quantile Regression. R package version 3.90. R Foundation for Statistical Computing: Vienna, 2006; http://www.r-project.org [Accessed 14 December 2006]. Additionally, the practice of using custom statistical implementations where the code is not available to other researchers is a classic indicator of an overfitted model. In this regard, a sample size of 40,000 is decidedly easy to overfit. In fact, it was proven by using cross validation techniques it is theoretically possible to overfit a model of infinite observations (first excerpt). NCFM eSnurra Group reported using cross validation techniques in Gjessing et al. 2007 with the caveat of "(results not shown)" in the second excerpt. And, since the NCFM eSnurra model is a black box, who is to know what it is doing or how, much less being able to reproduce the models for independent validation and/or comparisons. And, given NCFM eSnurra Group's ongoing research misconduct via plagiarism, overfitting a black box model could not be considered much of an ethical barrier. Yet, Directorate of Health somehow believe they have conducted proper due diligence without investigating the provenance of the idea and method of Population-based Direct EDD Estimation or the statistical techniques used in NCFM eSnurra Group's eSnurra method (i.e., the appropriated, plagiarized, misused Hutchon Method of PDEE) to assign EDD & GA values to all pregnancies and abortions in Norway. Contrast NCFM eSnurra Group's statistical techniques with respect to comparability and reproducability against those of the Bergen Group's Johnsen et al. 2004 (HC & BPD) & Johnsen et al. 2005 (FL) or Altman & Chitty 1997. All modules/packages and techniques used were clearly identified as well as how they were used and the Bergen Group did not write any customized statistical code to prevent other researchers from knowing what they did and exactly how they did it. Consequently, the NCFM eSnurra group was able to reproduce the Bergen Group's models. However, it is impossible for the Bergen Group to reproduce the NCFM eSnurra Group's models without the actual customized software implementation of the NCFM eSnurra Group. This is the confounding issue with respect to reporducibility and comparability for other researchers. Apparently, reporducibility and comparability were of no concern to Directorate of Health. One can predict/estimate y from x (via y regressed on x; i.e. y depends on x) if the dataset observations include both the x and y variables (x = independent variable; y = dependent variable). Not surprisingly, it is impossible to predict/estimate z from x (via y regressed on x) if the dataset only contains observations of x and y. Both Bergen Group and NCFM eSnurra Group regress on the very same independent x variable, i.e., ultrasound-based measurements of fetal metrics (e.g., BPD, FL, HC, CRL, MAD, etc.). However, these two groups use completely different dependent y variables. The Bergen Group's dependent y variable is gestational age (GA) on the ultrasound date, while the NCFM eSnurra Group's dependent y variable is the number of days remaining from the ultrasound date to birth/deliver. The Bergen Group predicts/estimates GA directly from ultrasound fetal metric measurements and NCFM eSnurra Group's method (i.e., the appropriated, plagiarized, misused Hutchon Method of PDEE) directly predicts/estimates days remaining from ultrasound fetal metric measurements to calculate EDD. Consequently, it is impossible for the Bergen Group to directly predict/estimate EDD and it is impossible for NCFM eSnurra Group to directly predict/estimate GA. However, Bergen Group and NCFM eSnurra Group can each calculate (not predict/estimate) their predicted/estimated complement EDD and GA, respectively, by using a fixed gestation time from LMPD (Bergen Group uses 282 days, NCFM eSnurra Group, 283 days). Consequently, the Bergen Group can subtract the predicted/estimated GA on the ultrasound date from the ultrasound date to calculate a virtual LMPD, and then add 282 days to calculate EDD. And, NCFM eSnurra Group can subtract the predicted/estimated days remaining to delivery on the ultrasound date from 283 days to calculate GA on the ultrasound date. Both Bergen Group and NCFM eSnurra Group depend on the use of a virtual LMPD date to calculate EDD and GA, respectively, and then subtract GA on the ultrasound date from the ultrasound date to calculate a virtual LMPD, respectively. And, because these are calculation methods and not direct prediction/estimation methods from ultrasound measurements, these "calculated" methods are sometimes referred to as "indirect" methods. To get an idea of NCFM eSnurra Group's conflate-to-obfuscate strategy, consider the excerpt below in the context of the preceding paragraph. NCFM eSnurra Group disparaged "traditional models" or, more specifically, Bergen Group, because Bergen Group does not directly predict/estimate EDD from ultrasound fetal metric measurements and, therefore, must calculate EDD from the LMPD established by their directly predicted/estimated GA. Consequently, and by using NCFM eSnurra Group's own reasoning, NCFM eSnurra Group must also believe they "primarily estimate EDD from second-trimester fetal measurements when they calculate GA, thus, gestational age (GA) "is actually an indirect and secondary issue" for NCFM eSnurra Group. Day-0 (or GA = 0w+0) of the median 283-day "gestation period" set by NCFM eSnurra Group is the virtual LMPD. Moreover, all GA values calculated by NCFM eSnurra Group depend on a virtual LMPD. Clearly, NCFM eSnurra Group's statement (above) was an agenda-driven shot at Bergen Group. Moreover, NCFM eSnurra Group cited themselves, twice (via "3, 5"), to buttress their fallacious point; and, perfidiously, cited Dr. Hutchon (via 6), from whom they had appropriated and plagiarized the Hutchon Method of PDEE. In the excerpt below, NCFM eSnurra Group conflate estimates of GA with estimates of EDD. NCFM eSnurra Group's method (i.e. the appropriated, plagiarized, misused Hutchon Method of PDEE) estimates EDD and, therefrom, calculates GA using the equivalent of Naegele's rule. In short, it is not "standard procedure to obtain estimates of the gestational age of the fetus and of the expected day of delivery." This is a conflate-to-obfuscate strategy, trying to communicate the terms estimate and calculate with respect to GA & EDD as synonymous; and, this has worked well because it is clear Directorate of Health is confused by direct estimation of GA and calculation of GA from a direct estimation of EDD to the point of incompetence. The first excerpt below is from the eSnurra Group's Gjessing et al. 2007. It attempts to disparage the direct estimation of GA method, the Campbell Method of GA Estimation, (Bergen Group) by claiming "the prediction of term is hardly ever mentioned." However, by making 4 simple word/phrase changes, the exact same reasoning can be applied to the direct estimation of days remaining for EDD (NCFM eSnurra Group, via the appropriated Hutchon Method of PDEE), because "the prediction of gestational age is hardly ever mentioned." Actually, NCFM eSnurra Group routinely claim to estimate GA in an agenda-driven effort to conflate their ability to estimate EDD with their nonexistent ability to estimate GA, with the intent of making estimations of EDD & GA synonymous. This point was made in Økland's 2012 NTNU dr.philos. Thesis (p. 35): "Consequently, the terms ‘assessment of GA’ and ‘estimation of date of delivery’ refer to totally different times in the course of a pregnancy — although they often appear to be considered synonyms." This is only because NCFM eSnurra Group have a a conditional definition of the word "estimate" whenever they use it anywhere close to the words "gestational age" or its abbreviation "GA."
The estimation methods are solely aimed at computing days remaining at the time of the ultrasound examination, the true problem of prediction of gestational age is hardly ever mentioned, let along made explicit, except for an 'understanding' that a certain number of days should be subtracted from the estimated end of pregnancy. is not trying to conflate-to-obfuscate to try to claim a prediction/estimation capability they do not have. regressed on ultrasound fetal metric measurements with GA as their dependent variable, not days remaining to date of delivery, in order to directly predict/estimate GA. Similarly, NCFM eSnurra Group regressed on fetal metric measurements but with days remaining to delivery date as their dependent variable, not gestational age. So once again, the Bergen Group does not predict/estimate EDD and NCFM eSnurra Group does not predict/estimate GA, despite what NCFM eSnurra Group claims with intent to deceive and/or confuse. Both groups must calculate the value they do not estimate directly (GA or EDD). In short, the Bergen Group and NCFM eSnurra Group are working from the opposite ends of the same gestational-street, so to speak, but the NCFM eSnurra Group wants the whole street but does not possess the wherewithal to actual take it. So, they conflate-to-obfuscate and within confusion lies opportunity; opportunity within the offices and backrooms of Directorate of Health. Finally, it is just ironic that NCFM eSnurra Group, who has been incessant in its denigration of Bergen Group and others for having to use the equavalent of Naegele's rule to calculate EDD from their direct estimations of GA, but now, and given the fact NCFM eSnurra Group claims to also "estimate" GA (which it does not), NCMF eSnurra Group also uses the equivalent of Naegele's rule to calculate GA from their EDD which is calculated from their direct estimations of days remaining to delivery. In deference to Dr. Huthchon, Naegele restated Boerhaave's algorithm for calculating EDD, which Naegele popularized so it became known as Naegele's rule; however, Naegele never claimed it as his own and gave full attribution to Boerhaave. The first claim is an agenda-driven message with neither substantiation nor references because with the addition of the statistician, Gjessing, local linearized quantile regression, a semiparametric regression technique, had been implemented to be featured in NCFM eSnurra Group's Gjessing et al. 2007. The second claim is a reference to the NCFM eSnurra Group's blatant appropriation and plagiarism of Dr. Hutchon's original idea and method, the Hutchon Method of PDEE, which NCFM eSnurra Group would present the following year as their own original idea and method in the NCFM eSnurra Group's Gjessing et al. 2007, thereby engaging in ongoing research misconduct via plagiarism. The third claim is a part of NCFM eSnurra Group's agenda to conflate the prediction/estimation of GA with the prediction/estimation of EDD in order to obfuscate the differences between these 2 completely different methods of establishing ultrasound-based GA & EDD for individual pregnancies and then presenting them as being synonymous among healthcare authorities, healthcare professionals and the general public when, in reality, these prediction/estimation methods have very distinct differences, not the least of which is the difference between the protocols of: 1) evidence-based medicine and 2) a government-mandated protocol of evidence-obviated medicine that obviates a pregnant woman's key pregnancy dates (i.e., LMPD/OTPD/SCID), without her prior, informed, voluntary, explicit consent, from the process of establishing the best GA & EDD for individual pregnancies. Not surprisingly, the government-mandated protocol of evidence-obviated medicine is proven to increase risks and cause grievous harms to some of Norway's women and their fetuses/babies. NCFM eSnurra Group conflates prediction/estimation of GA with prediction/estimation of EDD to obfuscate the differences beyond all understanding. Also, NCFM eSnurra Group's Eik-Nes et al. 2006, a Letter to the Editor of Acta from which this excerpt was taken was (and remains) research misconduct via plagiarism; and, the NCFM eSnurra Group article referenced via citation 10, Eik-Nes et al. 2005 (included below) was the first known instance of NCFM eSnurra Group's 12-years of ongoing research misconduct via plagiarism. Both Eik-Nes et al. 2006, the Letter to the Editor and the NCFM eSnurra Group's Eik-Nes et al. 2005 appropriated and plagiarized Dr. Hutchon's original idea and method as NCFM eSnurra Group's own original idea and method. Seriously, all of this in the two short sentences included in the excerpt below. This demonstrates the economy of words with which NCFM eSnurra Group prosecutes their science-bending agenda over straight forward medical research and science; a violation of the public trust. Håkon K. Gjessing, PhD of the Norwegian Institute of Public Health, who coauthored a book for Springer's Statistics for Biology and Health Series and who developed a genetic association analysis package for the open-source R-project.org. Per Grøttum, MD, PhD, Professor of medical informatics, Section of Medical Informatics, Faculty of Medicine, UiO. These two individuals could bring heavy-lifting statistical stalent to any study. However, it is abundantly clear these individuals used their talents to conflate estimated GA and calculated GA in NCFM eSnurra Group's Gjessing et al. 2007 paper in order to obfuscate their claim of GA estimation capability when, in reality, it was not (and is not) possible for NCFM eSnurra Group to estimate GA; GA must be calculated from NCFM eSnurra estimated EDD. The same conflate-to-obfuscate strategy was employed with a retrospective (looking back) study and a prospective (looking forward) study in order for NCFM eSnurra Group to claim their study, as reported in Gjessing et al. 2007 was a prospective study when, in reality, it was a retrospective database or register study. This is covered in detail below. Hakon K. Gjessing's UiB webpage for his genetic association analyses software package includes the following appeal for ethical propriety with respect to acknowledging, citing and referencing his work and, appropriately so, as there are too many who need to be reminded of the ethical etiquette. "Please: If you use my original idea and method (PDEE) as your country's official national healthcare method to estimate EDD, it will be much appreciated if you refer to Hutchon.net (this website), or better, to my 1998 OBGYN.net paper above." And, quite possibly in the were-it-to-have-been scenario above, Dr. Hutchon might well have appended the following excerpt from his seminal Hutchon 1998 to ensure his original idea and method (PDEE) were not misused. The objective of the NCFM eSnurra Group study, as explicitly stated in their 2007 paper was clearly defined (excerpt below) by the three NCFM eSnurra Group authors, the three "copyright owners" of NCFM eSnurra (© 2007 EikNes, Grøttum og Gjessing). "Objectives To introduce a direct population-based method for prediction of term based on ultrasound measurements of the biparietal diameter and femur length in the second trimester of pregnancy" (Source: "A direct method for ultrasound prediction of day of delivery: a new, population-based approach," H. K. GJESSING, P. GRØTTUM and S. H. EIK-NES; Ultrasound Obstet Gynecol 2007: 30: 19–27, p.23) . However, on the very next page their explicitly stated, clearly defined objective changed into a statement of mission leap, arrogantly bypassing the customary first stage of mission creep, which is a gradual shift in mission objectives (excerpt below). Remember from above, it is not possible for NCFM eSnurra Group to predict/estimate GA, they must calculate GA from a predicted/estimated EDD. NCFM eSnurra Group simply did not (and do not) have the required GA-dependent-variable data. It is interesting to note that "method for prediction of term" (in which the word "prediction" was technically correct with respect to the formal statistical inference definition) suddenly changed to "a method for estimating expected day of delivery and gestational age" when they decided to include gestational age estimation as an NCFM eSnurra capability equal to their EDD estimation capability, thus redefining their study's objective, and redefining the word "estimate" well after the study had been completed. And, here again (excerpt below), more mission leap via conflate-to-obfuscate, because it is impossible for NCFM eSnurra to estimate GA. They can only calculate GA from their predicted/estimated EDD. Again, they simply did not have the required GA dependent-variable data. Also, it is interesting to note the use of the word "prediction" and the word "estimates" referring to EDD and GA, respectively, as EDD had returned to being predicted (technically correct) with GA estimated (again, not possible without the GA dependent-varialble data). Again, all of the above was not an example of mission creep, which is a gradual shift in mission objectives, because NCFM eSnurra Group arrogantly bypassed mission creep to take the direct route to mission leap. And, as is almost always the case with mission creep or mission leap, the wherewithal to accomplish either creep or leap, does not exist. One can only wonder how this clearly stated mission leap made it through referees' reviews and past editorial review before publication in Ultrasound in Obstetrics & Gynecology. Specifically, the study makes no mention, nor provides any evidence of: 1) retrospective database gestational age data being collected for use as a dependent variable nor as any other type of variable, 2) gestational age being used as a dependent variable in their customized implementation (black box) of local linear quantile regressions, as described in their "Statistical methods" section. In short, the wherewithal to estimate gestational age did not exist, as is usually the case with mission creep and mission leap. Consequently, it was impossible for their study to estimate gestational age. However, it was absolutely clear the study was regressing on ultrasound fetal metric measurements for the remaining days (RE) until actual date of birth/delivery, but the study made no mention of regressing on ultrasound fetal metric measurements with GA as a dependent variable in order to be able to predict/estimate GA. Consequently, NCFM eSnurra Group must calculate gestational age (GA), as explained above. This conflate-to-obfuscate technique is intentionally deceptive, which is research misconduct via falsification. Moreover, NCFM eSnurra Group did this (and does this) to further personal ambitions and agendas. This is a violation of the public trust. Again, one can only wonder how NCFM eSnurra Group'sGjessing et al. 2007 made if through peer review and past editorial review before publication in Ultrasound in Obstetrics & Gynecology. It boggles the mind Directorate of Health either misses or ignores the important distinction between actually predicting/estimating fetal age and GA from ultrasound fetal metric measurements (Bergen Group) and calculating fetal age and GA from predictions/estimates of the remaining days until EDD using the equivalent of Naegele's rule, in reverse, (NCFM eSnurra Group). Clearly, the basis for determining fetal age and GA is not the end of the pregnancy, but its beginning, and not from calculations based on predictions/estimates of EDD (NCFM eSnurra Group) but from direct predictions/estimates of GA from fetal metric measurements (Bergen Group). The estimation methods are solely aimed at computing EDD at the time of the ultrasound examination; the true problem of prediction of GA is hardly ever mentioned, let alone made explicit, except for an ‘understanding’ that a certain number of days should be subtracted from the estimated date of delivery of pregnancy. Ergo: The NCFM eSnurra Group's approach of constructing reference charts has a number of weaknesses. Moreover, and with respect to the "let alone made explicit" point made by authors, it is not possible to make that which is not possible, explicit. The first excerpt (below) was NCFM eSnurra Group using the conflate-to-obfuscate strategy with respect to prediction/estimation and calculation. Clearly, this was neither medical research nor science; it was pure conflate-to-obfuscate to further the NCFM eSnurra Group's agenda. Again, one can only wonder how this stuff made it through peer review and then past editorial review before publication in the academic medical journal Ultrasound in Obstetrics and Gynecology. NCFM eSnurra Group appears to believe because the ultrasound-based fetal metric measurements that comprise their 1987–2004 dataset were made before the actual birth/delivery, that this somehow qualified their study as prospective instead of retrospective. Again, this conflate-to-obfuscate strategy requires temporally-challenged thinking, as it implies NCFM eSnurra Group believe all ultrasound studies on pregnancy, in the world, are therefore prospective because birth/delivery occurs after pregnancy. The thing that makes a prospective study prospective is that it is designed (i.e., hypothesis fully formulated, methods established, etc.) before subjects are enrolled and baseline data are collected and before any subjects develope the outcome(s) of interest or the outcomes are known. In general, prospective studies are rated higher among researchers in terms of their reliability and significance of evidence relative to retrospective studies. Also, prospective studies are generally more expensive than retrospective studies. Ergo, by identifying their study as prospective, NCFM eSnurra Group were able to reap the benefits of: 1) a higher rated study by leeching the halo effects of true prospective studies, 2) significantly lower cost per observation of a retrospective database study via the incredibly low cost of collecting historical ultrasound and birth/delivery data from government databases, 3) an incredibly high return of perceived study rating on a small investment (i.e., low cost of collecting historical data from government databases) and 3) the word "prospective" included in their study to ensure inclusion in computer searches seeking matches on the word "prospective." NCFM eSnurra Group had used the conflate-to-obfuscate strategy to "game the system," successfully. What could be next: Possibly, an arbitrage market for existing retrospective ultrasound studies relabeled as prospective studies? Ironically, NCFM eSnurra Group made this very point about prospective vs. retrospective studies in their Gjessing et al. 2007 (except below); the very publication NCFM eSnurra Group claimed was a prospective study. In the excerpt above, NCFM eSnurra Group makes the point that other researchers see retrospective database studies, such as theirs, "as less reliable than prospective studies." One would think this excerpt in conjunction with the conflate-to-obfuscate strategy should have been seen as a flashing-red light during peer review or editorial review prior to publication. NCFM eSnurra Group's Gjessing et al. 2007 was a retrospective database study. Interestingly, in the abstract of Gjessing et al. 1999 titled "Errors in Gestational Age: Evidence of Bleeding Early in Pregnancy" authors used gestational age data from the Medical Birth Registry of Norway. Consequently, the authors, including the lead author, NCFM Group's Håkon K. Gjessing, were compelled to include this caution statement regarding "the retrospective nature of the data" (excerpt below, emphasis added). Consider the first sentence from the "Methods" section of Pexsters et al. 2010 (first excerpt below). Note the authors' clear, unambiguous statement of: "A retrospective database study..." There is no pretense nor conflate-to-obfuscate strategy to imply their study was somehow a prospective study because birth/delivery occurs after pregnancy. And, while Pexsters et al. 2010 could have conflated retrospective and prospective to obfuscate their "Methods" section with NCFM eSnurra Group's words of 3-years prior: "a retrospective study using a prospective data collection approach," this would have been deceptive relative to "A retrospective database study..." NCFM eSnurra Group puts considerable effort into their conflate-to-obfuscate strategies depending on which of their agenda items is being communicated. The NCFM eSnurra Group study described in their Gjessing et al. 2007 is, unquestionably, a retrospective database study, even if birth/delivery were to have proceeded pregnancy. Moreover, the second excerpt from Pexsters et al. 2010 is good research and good science. NCFM eSnurra Group has never made a similar statement in any of their published papers. The only validations of NCFM eSnurra Group's models and "method" (i.e., the appropriated, plagiarized, misused Hutchon Method of PDEE) have been conducted by NCFM eSnurra Group themselves; consequently, there has never been a true, independent validation of NCFM eSnurra Group's models and method (i.e, the appropriated Hutchon Method of PDEE) to assess reproducability, ever, yet Directorate of Health selected NCFM eSnurra Group's models and method to be the implementation vehicle for their medically & ethically flawed, intentionally reckless, willfully negligent, 2014 Recommendation. It is interesting to note that the very point Pexsters et al. 2010 identified as important, i.e., "testing it prospectively on a different study population" (second excerpt above), is precisely what Kiserud et al. 2008 recommended to NCFM eSnurra Group regarding their Gjessing et al. 2007 (first excerpt below). Moreover, Kiserud et al. 2008 raised the same concerns as those stated about regarding NCFM eSnurra Group's conflate-to-obfuscate strategy with respect to retrospective and prospective studies (excerpt below). Moreover, it is interesting to note that this same Kiserud et al. 2008 correspondence raised the same issues (excerpt below) as those discussed earlier regarding NCFM eSnurra Group's conflate-to-obfuscate strategy with respect to retrospective and prospective studies. Included below are all 6 occurrences of the word "prospective" within the NCFM eSnurra Group's Gjessing et al. 2007. There are no occurrences of the word "retrospective." It is interesting to note that none of these occurrences serves to explain the logic of how a 2007 study using data routinely "collected during the years 1987–2004" was defined as a prospective 2007 study other than the obvious fact that birth/delivery occurs after pregnancy. Also, the fourth excerpt above is a disingenuous attempt by the authors to denigrate legitimate prospective studies that may be resource constrained (most are), but what is even more limiting and more important is that the size of a legitimate, prospective study is set by, and strictly limited to, the size established by the statistical power calculation. This is a fact of which NCFM eSnurra Group authors and NCFM eSnurra "copyright owners" Håkon K. Gjessing, PhD of the Norwegian Institute of Public Health and Per Grøttum, MD, PhD, Professor of medical informatics, Section of Medical Informatics, Faculty of Medicine, UiO are very well aware. Nevertheless, they are committed to the NCFM eSnurra Group's agenda; an agenda that necessitates unethical decision-making, on many levels, including research misconduct via plagiarism and falsification. NCFM eSnurra Group claimed in their ﻿Økland et al. 2011﻿ paper (first excerpt below) that the 1987–2005 historical database data were somehow prospectively registered. Again, NCFM eSnurra Group believed their data were prospectively registered 30-years before their study was designed simply because birth/delivery occurs after pregnancy. And, the same thing again, in their Økland et al. 2012 paper (second excerpt below), using 1988–2009 historical database data. Again, these studies were retrospective database studies. As before, NCFM eSnurra Group believe all ultrasound studies on pregnancy, in the world are therefore prospective because birth/delivery occurs after pregnancy. Again, one can only wonder how these papers made if through referees' reviews and then past editorial review before publication in UOG. One benefit of NCFM eSnurra Group's use of retrospective historical database data of ultrasound measurements and birth/delivery data is that it makes it incredibly convenient and easy to recycle the same dataset anytime they come up with an idea for a new study or a set of nearly identical studies, possibly several years later. Consider the potential of variances due to secular trends (or secular drift) and/or confounding (or missing) variables over the NCFM eSnurra dataset's 18-years calendar interval that could have had an effect on gestation time. If one or more secular trends did have an effect, the dataset would be correspondingly biased, thus any future predictions/estimations made via corresponding models would be biased. Just as an example, NCFM eSnurra Group's Gjessing et al. 2007 included several covariates, but only birth year range had an effect; a very large effect on FL-based predictions in the last 6-year period of the dataset that went completely unexplained in Gjessing et al. 2007. This was stated to be the result of older ultrasound technology of wider beam widths in the lateral direction of measurement on FL. Papers describing these technology-induced measurement errors were published in the 1980s. However, there may be other potential secular trends and confounding variables masked in historical datasets, which is a common problem among retrospective studies using historical databases. The fact that the secular trend induced in FL measurements as a result of constantly improving ultrasound technology throughout the years 1987–2004 enabled less distorted measurements of FL is a good example of why the study reported in Gjessing et al. 2007 and their other publications were retrospective studies, not prospective studies. Note: remember the -2.3 FL adjustment is added to the days remaining estimate to delivery (not to EDD), thus making the fetus or GA 2.3 days older to compensate for the secular trend of improving ultrasound technology. There is an agenda-driven supposition (first excerpt below) in the "Conclusions" section of the Abstract of NCFM eSnurra Group's Økland et al. 2010​. Additionally, this supposition was not restricted to the Abstract, it also appeared in the body of the paper (second excerpt) where it was stated more as a fact and not as a supposition. A supposition is not a conclusion because a supposition is a belief held without proof or certain knowledge, such as an assumption. In short, a supposition is not a conclusion. The first sentence of the "Conclusion" section of the Abstract contains 17 words (or 31%) of the conclusion, while the second sentence, a supposition contains 38 words (or 69%) of the conclusion. When the "Conclusion" section of a paper's Abstract is filled with 69% supposition it means either: 1) there was little or no resulting evidence to conclude something substantive and/or 2) the authors had a non-science agenda to communicate. Again, one can only wonder how this NCFM eSnurra Group's agenda item made it through referees' reviews and past editorial review before publication in Ultrasound in Obstetrics and Gynecology. It is important to note that NCFM eSnurra Group's Økland et al. 2011 paper did not prove selection was the source of bias. Notice how in the "Conclusion" section the authors state: "These models have important shortcomings, probably because of strict selection criteria..." and 5-pages later the authors state: "The selection criteria of the sample-based models are important in producing these biases." So, which was it? Even though their study did not prove it, the authors were compelled to make their supposition in the "Conclusion" section because they wanted to communicate selection bias, without proof, which was NCFM eSnurra Group's agenda. Ergo, NCFM eSnurra Group's Økland et al. 2010 concluded in a supposition, an oxymoron. Communicating an agenda-driven message in paper published in an academic medical journal speaks to the ethos of scholarship, academic integrity and independence of the authors. Despite the obvious effects of increased risks, critical mistakes, grievous harms and negative medical outcomes, this systemic, institutionalized problem of evidence-obviated medicine is an information rights issue as much as it is a problem of intentional recklessness and willful negligence. Not surprisingly, this problem is not limited to Norway. A large part of what makes this problem systemic is articulated by NCFM themselves in the following excerpt from their website. Directorate of Health's Johan Torgersen and Torunn Janbu did no small amount of marketing & promotion for NCFM eSnurra Group in their article "Directorate of Health - and eSnurra" ("Helsedirektoratets rolle – og eSnurra") published in Dagens Medisin, 2015-04-13. However, the last sentence is a bit confusing in English and Norwegian. "EASILY ACCESSIBLE. eSnurra has been developed at the National Center for Fetal Medicine (NSFM) in Trondheim, in collaboration with the Department of Medical Informatics at the University of Oslo and the National Public Health Institute. eSnurra as a national tool is readily available as a plastic wheel and there is an open available online version (www.esnurra.no). It is also available as an app for Android, iPhone, iPad-installed in over 90 countries as well as Norway. After performing traditional ultrasound measurements of the head and thigh, the data can be used in all modern ultrasound machines." In smaller Norwegian towns midwives and doctors conform to what they are told, taught and trained by NCFM and NCFM eSnurra Group. They were told, taught and trained to practice evidence-obviated medicine with respect to obviating a pregnant woman's key pregnancy dates (e.g., LMPD/OTPD/SCID) at the scheduling of a pregnant woman's "routine" 18wUSE, without her prior, informed, voluntary, explicit consent. Consequently, after the ultrasound exam, and during a pregnant woman's next appointment with her midwife or doctor she may learn her gestational calendar has been rest to conform with her assigned ultrasound-based NCFM eSnurra BPD-based EDD & GA, again, without her prior, informed, voluntary, explicit consent. Laila's midwife did not tell her that her GA & EDD calendar had been "corrected" by the ultrasound exam. Laila discovered it by looking at her pregnancy log which her midwife would update for Laila at each appointment. Laila's "corrected" EDD & GA meant Laila was supposed to accept that she and Edward had somehow been mistaken, by 12 days, regarding all of Laila's key pregnancy dates; dates Laila & Edward meticulously recorded in Laila's pregnancy spreadsheet when each presented. In short, Laila's medical professionals expected Laila & Edward to believe 2 + 2 = 5 in the special NCFM eSnurra Group's version of alternative mathematics, but Laila and Edward refused to recognize alternative mathematics and alternative facts i.e., the "official" NCFM eSnurra BPD-based EDD & GA assigned to Laila's pregnancy, again, without Laila's prior, informed, voluntary, explicit consent. Also, Laila was forced to accept a quantified (Gjessing et al. 2007), undisclosed 12.8% risk that her pregnancy would be assigned a grossly inaccurate (i.e., < -14 days or > 14 days) NCFM eSnurra BPD-based EDD and, therefrom, a calculated GA using the equivalent of Naegele's rule, in reverse, that was also grossly inaccurate. No rational pregnant woman would knowingly accept an unnecessary 12.8% risk for herself and her fetus/baby while in ownership possession of a combined, fully corroborating, factual LMPD/OTPD/SCID-based GA & EDD given the only method that could be more accurate is if the woman were to have had an in vitro fertilization date (IVFD) to establish the beginning of her pregnancy, which would only be more accurate in terms of hours, not weeks and days. Moreover, there is no arguing this point with either logic, basic human biology or basic gestational mathematics because all discussions and arguments with Laila's medical professionals ended with "this is how we do it in Norway" or "this is The Rule" or "these are the Norwegian guidelines" (i.e., mandate). So, Laila and Edward were told to get on board with NCFM eSnurra Group's alternative mathematics and alternative facts and believe 2 + 2 = 5, just as all of Laila's medical professionals had been told, taught and trained to believe, no matter what contradictory medical evidence was available. In summary, at the scheduling of Laila's "routine" 18wUSE, Laila's combined, fully corroborating, factual LMPD/OTPD/SCID-based GA & EDD, and all of Laila's other key pregnancy dates, were obviated, without Laila's prior, informed, voluntary, explicit consent. These key pregnancy dates, especially the combined, fully corroborating, factual LMPD/OTPD/SCID were medical evidence that would neither be be seen nor used again by any of Laila's medical professionals. Unfortunately, it was apparent Laila's medical professionals were doing exactly as they had been told, taught and trained, and with a decidedly pride-filled attitude. Consequently, Norway's medical professionals' medical thinking had been compromised by Norwegian Directorate of Health's medically & ethically flawed, intentionally reckless, willfully negligent 2014 Recommendation with their exclusive implementation of NCFM eSnurra Group's method (i.e., the appropriated, plagiarized, misused Hutchon Method of PDEE) within a government-mandated protocol of evidence-obviated medicine. In the sage economy of words of Bergen Group and NGF, this is "medically flawed" and "can be directly dangerous," respectively. It is the training from NCFM and NCFM eSnurra Group that conditions Norway's doctors and midwives into the cognitive behaviors of institutionalized confirmation bias and doublethink which result in critical medical mistakes; critical medical mistakes such as assigning a grossly inaccurate NCFM eSnurra BPD-based EDD & GA to a pregnancy while masking an FGR/malformation or other fetal pathology by assigning a grossly inaccurate, younger, GA to the fetus/baby (i.e., grossly smaller than accurately average BPD head measurement = grossly smaller age = grossly big mistake) and preventing the routine turning of a fetus/baby from breech to vertex, in time, before the onset of labor; critical medical mistakes that increase medical risks and cause grievous medical harms to some of Norway's women and their fetuses/babies. And, insidiously, there is absolutely nothing in place to stop this, yet. Moreover, these critical medical mistakes are silently and invisibly written off, unattributed, undocumented & unreported, as acceptable collateral damage of Directorate of Health's medically & ethically flawed, intentionally reckless, willfully negligent 2014 Recommendation. Again, in the sage economy of words of Bergen Group and NGF, this is "medically flawed" and "can be directly dangerous," respectively. Included below is the morning session agenda of the first day of the NCFM 25 Years Anniversary Symposium (Jubileumssymposium, Nasjonalt senter for fostermedisin – 25 år) which reads as if it were an NCFM eSnurra Group medico-marketing event to spread evidence-obviated medicine. Also, it is interesting to note that all of the prime-time morning session speakers are authors of the four papers included in Inger Økland's 2012 NTNU dr.philos. Thesis; the academically compromised thesis used by Directorate of Health to justify their medically & ethically flawed 2014 Recommendation within a government-mandated protocol of evidence-obviated medicine at the scheduling of the routine 18wUSE. Start June 1, 2016, kl. 10.00, End kl. 17.30. The gestational age (GA) calculated by NCFM eSnurra Group from the estimated end of pregnancy (i.e., the wrong end) using the equivalent of Naegele's rule, in reverse, provides different results depending on which NCFM eSnurra Group platform is used (i.e., NCFM eSnurra pregnancy wheel, website, iOS app or Android app). 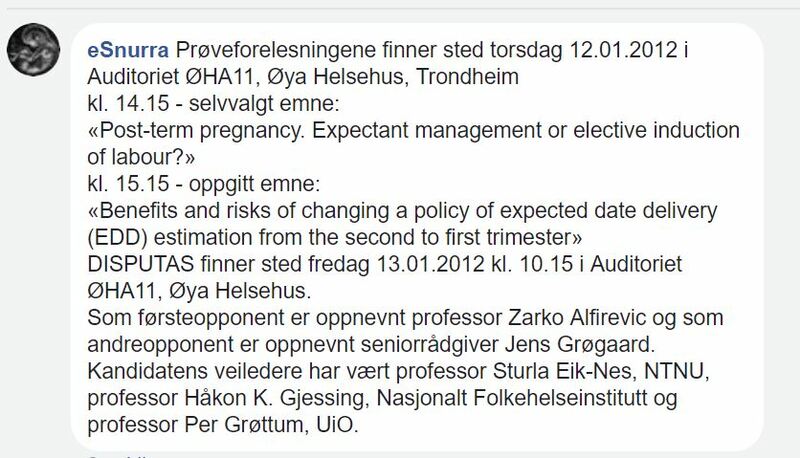 To say this is a flawed and cavalier approach to establishing consistent "official" medical GA for all pregnancies and abortions in Norway would be an understatement and serves as additional confirmation of the explicit warnings issued by NGF and Bergen Group. eSnurra is a population based method for determining the gestational age, the estimated date of delivery and the weight of a fetus." "eSnurra is an evolution of the old “Snurra” that has been in use in Norway from 1984 until eSnurra came in the first edition in 2007." The old NCFM "Snurra" method was an implementation of the Campbell Method of Gestational Age Estimation, Campbell (1969) which was completely replaced by the NCFM eSnurra "method" i.e., the appropriated, plagiarized, misused Hutchon Method of Population-based Direct EDD Estimation (PDEE), Hutchon (1998). Consequently, there was no "evolution" of the old 'Snurra'" to eSnurra. The FL & BPD measurements used in the test were identical, 29 mm and 41 mm, respectively, for both NCFM eSnurra Group's Android APP and their Website; and, the ultrasound date was also identical, all of which can be confirmed by comparing the values in the 2 screen images above. Moreover, the, NCFM eSnurra Group's Android APP had been downloaded on the same date as the test, 25.09.2017. Consequently, the Android APP version was current. The EDD provided by NCFM eSnurra Group's Android APP and Website for BPD = 41 mm were identical, 28.02.2017 (grossly inaccurate); however, the GAs (also grossly inaccurate) were not identical, but should have been. If NCFM eSnurra Group's current Website version, using a 282-day gestation period instead of NCFM eSnurra Group's 283-day gestation period were to have been used for Laila's pregnancy to establish Laila's NCFM eSnurra BPD-based EDD and, therefrom, calculated Laila's GA, using the equivalent of Naegele's rule, in reverse, then Laila's GA would have been 1-day younger, and her baby would have been delivered (via an unwanted, unnecessary Cesarean section surgery) as preterm at NCFM eSnurra BPD-based GA = 36w+6. (Note: GA < 37w+0 at birth/delivery is the definition of preterm.) Again, Laila's combined, fully corroborating, factual LMPD/OTPD/SCID-based GA = 38w+5 at delivery on 04.02.2017. Sometime after Laila's pregnancy NCFM eSnurra Group created a veritable 1-day GA arbitrage opportunity. When one wants or needs a pregnancy or fetus to have an "official" medical GA which is 1-day younger than the GA calculated from the estimated end of pregnancy (i.e., the wrong end) using the equivalent of Naegele's rule, in reverse, via NCFM eSnurra Group's Android APP, one can simply use their Website platform for an "official" medical GA which is 1-day younger. Finally, this NCFM eSnurra 1-day GA arbitrage appears to confirm Directorate of Health's stated concerns (below), but at a more granular level.